Damage caused by leaking water pipes can be extremely expensive and may involve digging up your tarmac, lawn, or paving. Save yourself costly leaking pipe repairs by caring for your plumbing pipes year round. 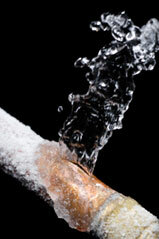 During winter temperatures can drop below zero and freeze water in pipes. As water changes to ice, it expands by as much as 10%. The resulting pressure can bust the pipe or force open couplings.